Earlier this week marked the 10 year anniversary of the death of British Bulldog Davey Boy Smith. It's hard to believe so much time has passed. Today (May 20th) we mark the one year anniversary of "Macho Man" Randy Savage's passing. Both men were two of my favorites growing up, and I'm sad that they're not here anymore. I was in high school when Savage won the WWF title the first time around. Even though I was a fan of his, I was pulling for Bam Bam Bigelow (RIP) to win the Wrestlemania IV title tournament. But in the end, it made sense to go with Macho Man as he carried the torch and lead the company in Hulk Hogan's brief absence. I always enjoyed Savage's unique voice, as I will still break into a "dig it!" or "Ooooh yeah!" every now and then. I also like his colorful ring attire, music, and overall attitude in and out of the ring. 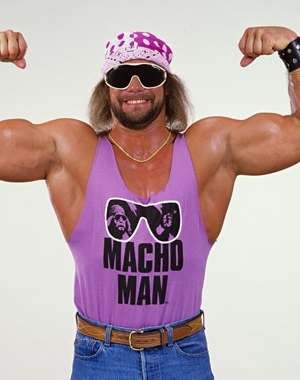 Heel Macho Man was always more enjoyable for me, as I thought the face Savage was a bit out of character for him. In the year since his death, I've gained a new appreciation for Randy Savage. I was disappointed, but not surprised that the WWE didn't induct him into the Hall of Fame this year. I do hope his time comes soon, as he truly deserves. Take a moment today to remember the Macho Man and his family. May he continue to rest in peace.